Vita was always explained to me as the Paradox of NE. However, over the years I think Vita has far surpassed Paradox in options. 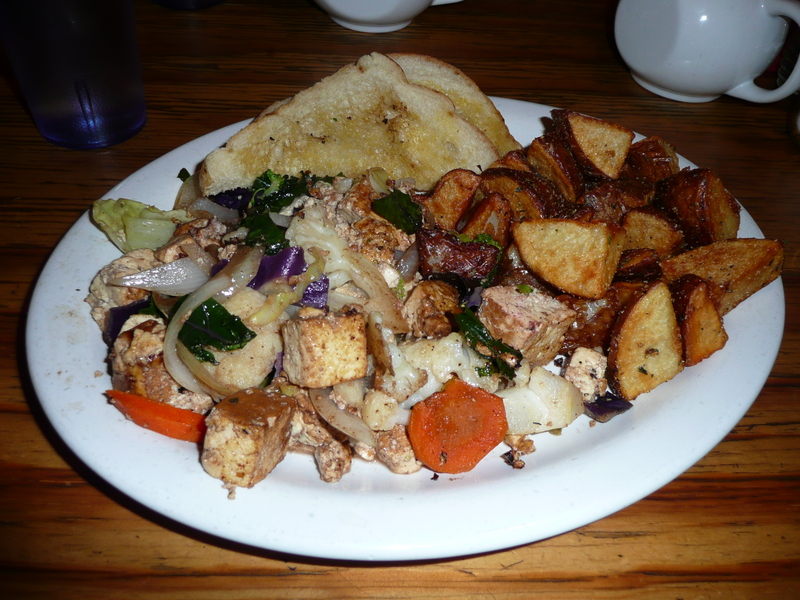 Even though they now serve meat, their vegan options are plentiful and always hit the spot. Vita is a great place to take the omni relatives so you know you’ll get a great vegan meal at a reasonable price. Vita is often referred to as “comfort food.” While it’s true their Vegan Mac and Cheese, tempeh Chicken Fried Steak and seitan Philly Cheese Steak sandwiches are comfort foods, Vita’s menu extends to more complex dishes like the Sun-Dried Tomato Polenta dish with a ginger-carrot sauce and Super Grain Salad including currants and pumpkin seeds. I admire their “seasonal menu” options because it’s always nice to see a restaurant buy and cook local. Some of our favorites include: Vegan Nachos, Vegan French Toast, Chicken Fried Steak, Tofurky Florentine, BLT, Caesar Salad, Mac and Cheese, Fish and Chips and Biscuits and Gravy. 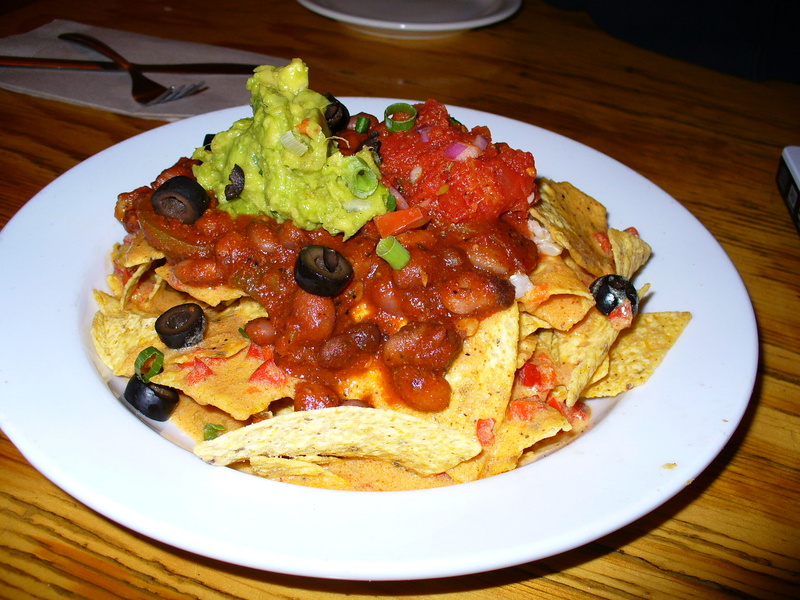 The Vegan Nachos consists of crunchy corn chips that are topped with short-grain brown rice, chili with kidney beans and tvp, spicy cheesy sauce, guacamole, tofu sour cream, salsa and black olives. Simple yet filling. Watch out if you’re a fellow cilantro hater, it seems to be a new addition to their nachos. The Vegan French Toast is a couple of thick sourdough bread slices dipped in Vita’s own vegan batter. The dish is served with vegan margarine and your choice of coconut syrup or maple syrup. If you’re a fan of sweet breakfasts go with the maple syrup as the coconut syrup is not too sweet. 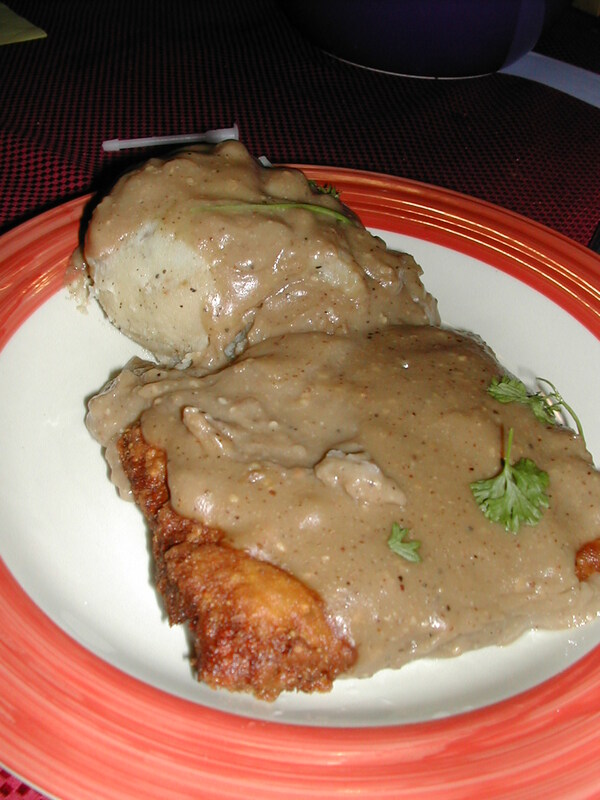 The Chicken Fried Steak, perhaps the most talked about, is a slab of tempeh, battered and fried. 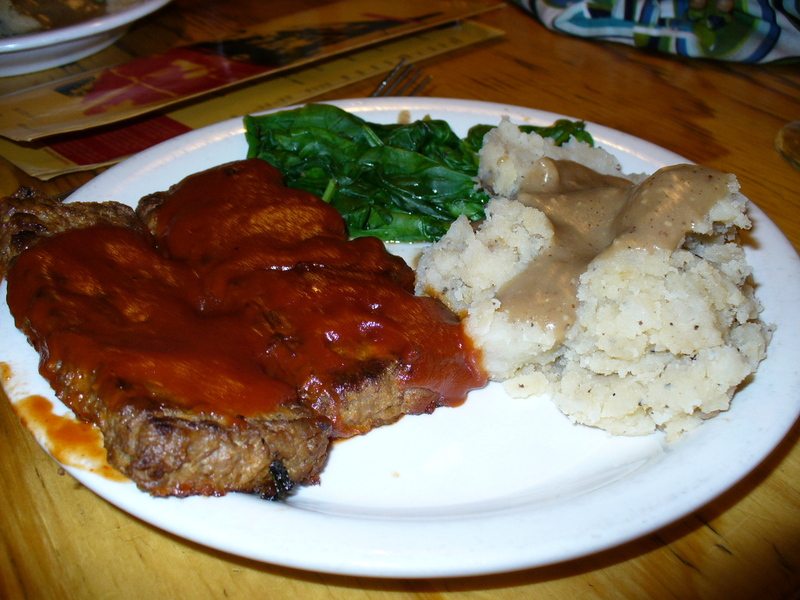 The result is a wonderfully crispy steak with a side of mashed potatoes, that’s all covered in a slightly sweet almond gravy. The Torfurky Floretine is perfection. Well, that’s what my frequent dinning companion would say. Vegan biscuits topped with marinaded tofu, tofurky slices, steamed spinach all topped with a tangy hollandaise sauce. 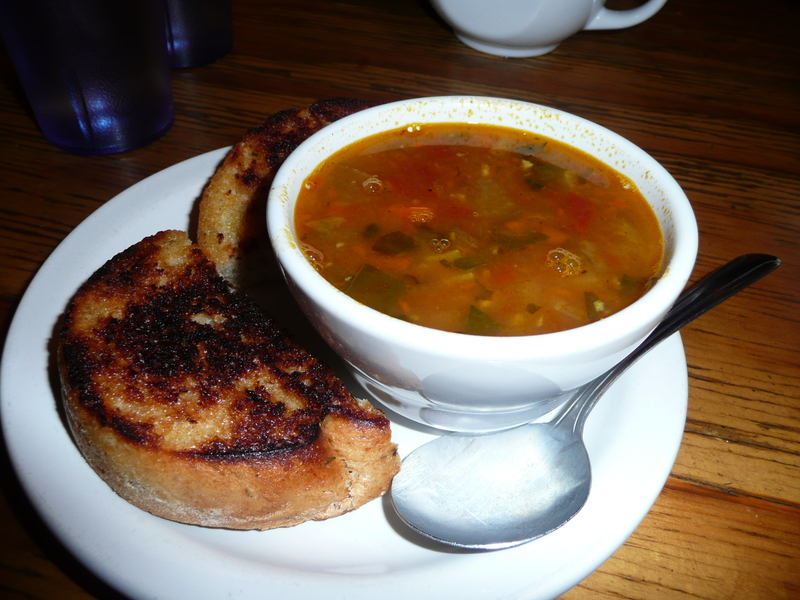 Ask for it with a side of home fires and you have a meal made for the hungriest of people. The Sun-Dried Polenta features a beautiful presentation, if only the flavors tasted as beautiful in my mouth. 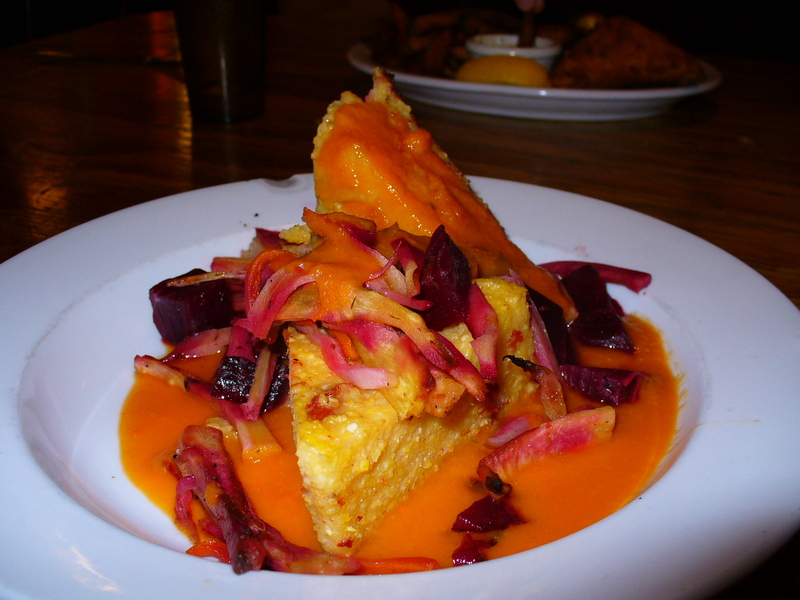 The deep colors of orange carrots, yellow polenta and red beets made we feel warm just looking at the dish. The sun dried tomato infused polenta itself had a great firm texture and tasted great but I wanted a deeper flavor to go with the dish instead of a tart carrot-ginger sauce. I wouldn’t order this dish again. The Mac and Cheese is a dish that seems to vary with the cook. Some days it is a flavorful dish and some days it has just barely enough cheesy sauce to cover the pasta. I recommend adding either the fried tempeh or the broccoli and some extra salt and pepper. 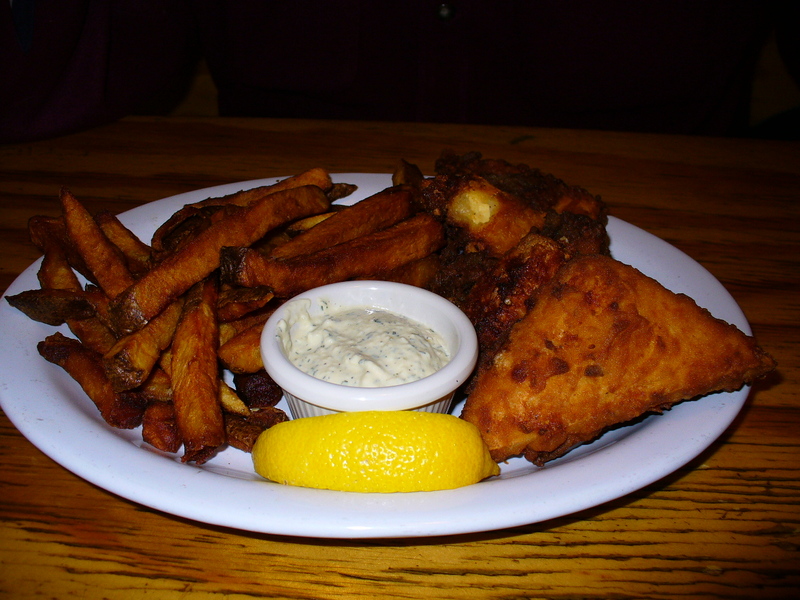 The Fish and Chips is always my fall back option. I love a fried dish when my stomach can handle it. Thick cut french fries and tofu wedges dipped in a flavorful batter and fried served with a dill tarter sauce and malt vinegar. For dessert Vita provides cakes, pies and other sweets from Piece of Cake and sometimes Sweetpea Baking Company. I always recommend Sweetpea Baking products. If you’re not happy with it, call me and I’ll finish your dessert! It’s always a good idea, but odd, to ask how old the cake is to avoid paying $4 for a piece of stale, flavorless cake. Take a look and see how many slices are left if you don’t want to ask. With Vita’s added menu items involving meat and eggs, some haven’t been happy with the change, but it seems it’s been great for business. I’ve watched Vita change from a primarily veg*an punk restaurant to a diverse, family-friendly, neighborhood cafe. The decor now resembles an average Northwest cafe or diner with bright colored walls and interesting art pieces, including the shelf made of bike frames. The high-back booths are great for large parties and provide a lot of privacy, which is nice because the restaurant can get loud some evenings. The new outside seating has been a great addition to Vita. Bocce ball, wi-fi, the unique fence and art, your pup and unbrella covered picnic tables make it a wonderful place on warm days. If you haven’t been to Vita in awhile, go experience it again. They recently remodeled after a fire and have probably added items to their menu. If you’re vegan and have never been there, check it out, specifically something fried! The mac and cheese and the chicken fried steak were the first two dishes my boyfriend and I ever ate in Portland. We ate there our first night in town, and knew it was something special. I agree with Webly regarding the changes in the mac and cheese, but I also like that it varies with the cook, it makes it personal (though it’s almost a nerve-wracking experience with the first bite). 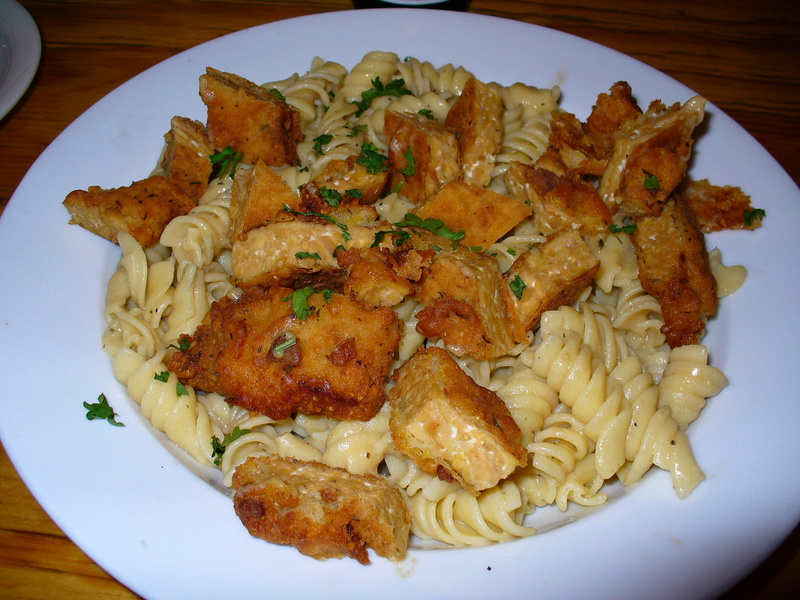 I also really enjoy their breaded tempeh sticks, and always like the nachos. Keep an eye out for the daily specials as well – I had a ginger miso noodle dish really hit the spit once. the philly “steak” with vegan cheese is great! it’s a new option, i believe. i love Vita except i find that it can be on the expensive side. especially since most things don’t some with sides. for instance, vegan cheese was an extra dollar making the sandwich $8 or 9. pretty ridiculous….it was a good sandwich, but the cost was ridiculous. Hey, I read your blog all the time and figured I should tell you about my work. Jace Gace on Belmont, we serve waffles, coffee and beer. We’re offering a vegan waffle and it’s amazing! I hope you stop by, 2045 SE Belmont. Thanks! Thanks for the heads up, Kirk! I hadn’t heard of this place before. I’ve never seen that cilantro haters website, that’s awesome! I wish I could share with cilantro haters how amazingly wonderful it tastes, maybe it’s a genetic thing, like that chemical you taste in biology class in high school, where some people can taste it but most people can’t? Hmmm. I’ll have my mercury fillings out soon and be eating it three times a day for at least a year, so it’s a good thing I love the stuff. Do you guys know about the new menu items? 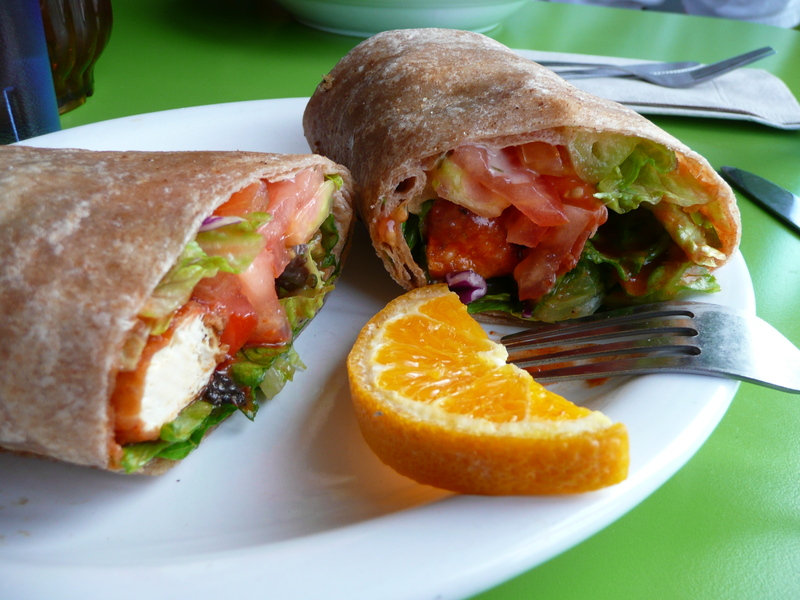 They’ve got a buffalo wrap and a buffalo wing plate — both super yummy! I think there are other new things, but I forget what and haven’t tried them. Just thought you guys might want to know! Thanks for the tip, Michelle!